Baron Corbin, Erick Rowan, Apollo Crews, Rhyno, and Dolph Ziggler are hanging out in a locker room. Everyone is talking except for Dolph who seems uncharacteristically down. AJ Styles walks up and proclaims himself “the new fact that runs the place.” Styles gets in Ziggler’s face and calls him a loser which prompts Ziggler to attack. Hype Bros, The Usos, American Alpha, Carmella, Naomi, Becky Lynch, Nikki Bella, Natalya, Alexa Bliss, The Ascension, Breezango, and The Vaudevillains are all in the ring along with some new title belts. Shane McMahon and Daniel Bryan then head to the ring. Shane talks about giving opportunities to the superstars on SmackDown. 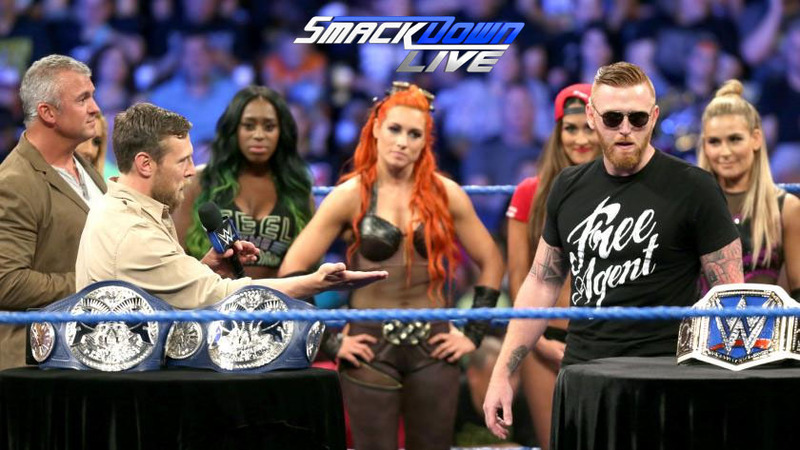 Daniel and Shane announce the SmackDown Women’s Title and a 6-Pack Challenge to determine the first champ at Backlash. They also announce the SmackDown Tag Team Title, the first champs to be determined in a tournament that will end at Backlash. Heath Slater interrupts the proceedings. He heads to the ring and says he wants some gold. Daniel and Shane point out that he’s not a woman, he doesn’t have a partner, and he’s not even a part of SmackDown. Slater says he can find a partner. Shane and Daniel tell him that if he really can find a teammate, then he can enter the tag tournament. If he wins, not only will he be a champ, but he’ll get a SmackDown contract. AJ Styles comes out next, and he’s upset. As he heads to the ring and yells about not being paid enough attention to, Dolph Ziggler attacks him from behind. The superstars in the ring break them up as we head to the first commercial break. A good, quick match. Both women looked good. I like Alexa’s little tantrums, and she delivered a good sunset flip powerbomb (though there was a slight bit of awkwardness getting into it). Heath Slater asks The Miz to be his partner in the tag tournament. Miz seems to agree, but he was actually talking to Steven Spielberg on his Bluetooth. Or, at least, that’s what he told Maryse. Good match. The Ascension attacked The Usos before they were ready and dominated a good part of the match. This set up The Usos to do what they do best: come back from behind with speed and some exciting moves. It was short, but it was a good first match in the tournament. AJ Styles heads to the ring. He gloats for a bit about beating Cena at Summer Slam. He proclaims that he should be the new number one contender for the WWE Title. As he continues to talk, Dolph Ziggler comes out and has to be held back by some referees (and Jamie Noble). Daniel Bryan has had enough. He agrees that Styles deserves to be number one contender, but it seems that he and Ziggler want to fight. So Bryan makes the match. If Styles wins, then he gets Dean Ambrose one-on-one at Backlash. If Ziggler wins, then he will be added to the title match at Backlash, making it a triple threat. Curt Hawkins once broke a promise… in half. Death once had a near-Curt Hawkins experience. Winter is worried that Curt Hawkins is coming. Carmella makes her way to the ring for a match. Nikki follows next. Nikki is asked by Renee Young about returning to the ring, but as she starts to answer she is attacked by Carmella from behind. She beats on Nikki until the ref sends her to the back, but Carmella comes back for a little more. Randy Orton heads to the ring. Orton questions whether Shane should have entered the ring at Summer Slam, but before he can really start to say what he came out to say Bray Wyatt interrupts. Bray sits in his rocking chair at ringside and asks Orton how his head is. He reminds Orton that he is just a man. Bray, on the other hand, is a god. The lights go out and Bray disappears. Charly Caruso asks Shane McMahon about Lesnar and whether or not Stephanie will take this situation seriously. Shane doesn’t think so. Obviously. Shane says “this thing” between him and Lesnar is far from over. Heath Slater tries to convince Arn Anderson to be his tag partner. Slater tells him that Anderson is his last chance. Anderson doesn’t like being the last choice. Slater is distraught, but Rhyno comes up from behind and tells Slater that he’ll team with him. Very good match. This was more competitive than I expected. I was afraid that American Alpha would completely dominate, but they didn’t. Breezango had a lot of good offense and even had a few believable near falls. Tyler Breeze is still the standout on the team of Breezango, but he and Fandango both looked like believable contenders for the tag titles. American Alpha did what they do best: lots of suplexes and power. This was fun to watch. Charly Caruso asks Dean Ambrose for his thoughts on the main event tonight. He’s been gambling and not paying attention to the show, so he doesn’t even know who’s fighting. Very good match. This might have been better than Ziggler’s match at Summer Slam (though not as good as Styles’). Ziggler continues to bring emotion into his matches, and Styles looks like the top guy on SmackDown. That combination made for a very entertaining match. I liked this show. I’m not a huge fan of the designs for the new titles, but I understand why they’re making them all look the same. And after the Universal Title was revealed, it’s no surprise that the SmackDown Women’s and Tag Titles are just color-swapped versions of the other Women’s and Tag Titles. But if these are being called the “SmackDown” titles, then will the ones on RAW have their names changed to match the naming convention? They probably should. And they should have the colors adjusted as well. I doubt they’ll do that though. You know, at this point I actually wouldn’t mind if they went ahead and unified the US Title with the Universal and the IC Title with the World. It would help make the singles titles more important. It would also instantly add some history to the Universal Title. I like the idea of a tournament for the tag titles, and I thought it started well tonight. I wonder who will be the eighth team though. There were only six in the ring tonight and the team of Slater and Rhyno makes seven. I was hoping for Breezango to be the first champs, but now I’m not sure who I want to win. I expect American Alpha to win, but I kind of hope they don’t. I want to see them chase the titles for a while. I’d like to see Becky Lynch be the first SD Women’s Champ. She might be too obvious a choice, but she deserves it after how long she chased after the Diva’s/Women’s title before. They showed again why they’re both top guys. Ziggler just never seems to be there at the right time.